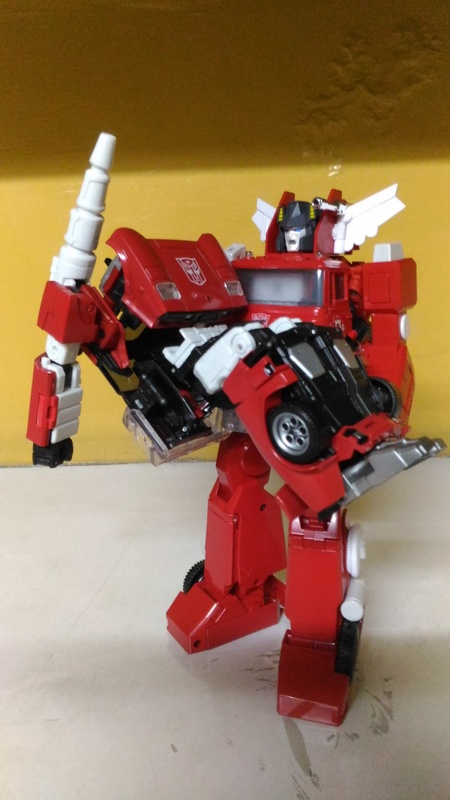 I can’t believe I haven’t written up a review for MP-33 Inferno. I’ve had this Masterpiece Transformers figure for a good while now. I actually planned to write up a review when it was released. I even went out to get it when I heard it was released. But, for some reason, it seems to have slipped my mind. Well, better late than never. Here’s my super delayed review for Masterpiece Inferno, and I’ve got a lot to say about it. 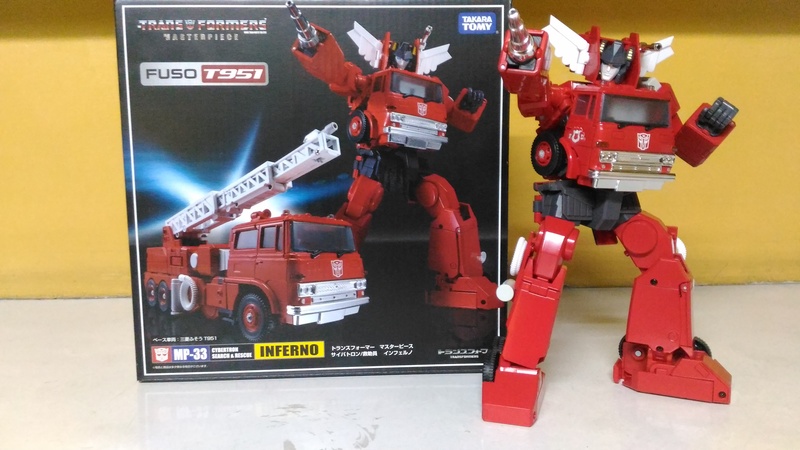 Now, no offense to any Inferno fans out there but, of all the possible characters that could have been shortlisted for Takara to make a new Masterpiece figure, why was Inferno high on the list? He wasn’t the most notable of the Autobots nor was he one of the most popular ones. That won’t matter as long as the figure is good, right? Well, Takara got half of Inferno right, so to speak. Inferno’s robot mode is actually pretty good. It’s his vehicle mode that’s kind of crappy. Not quite like the pose in the box… but close enough! Let’s go over his good side, which is his robot mode. I actually love Inferno when he’s in robot mode as he doesn’t have many flaws. Thanks to some heavy ratchet joints in his legs, he’s incredibly stable and is very easy to get him into some really good poses. He’s also very sturdy and practically all of his gimmicks and accessories rely on his robot mode. One of the weirdest options you get with the figure is what kind of helmet you want Inferno to have on his noggin. This is because Inferno had two helmet styles throughout his run in the cartoon. The animated Transformers had a lot of animation errors and was shown with a lot of inconsistencies. So, just to make sure that fans would get the helmet they want the most, Takara gave fans two different styles to choose from. But those aren’t the only accessories for Inferno’s head! Takara also included four different facial expressions you can swap out! My pick would be the “standard” helmet Inferno has installed out of the box but with the “grimacing” face on. Just looks more action-y. Hey, he’s not Man-E-Faces from Masters of the Universe! One thing I have to mention is a really neat feat of engineering Takara did with Inferno’s right arm. You’ll notice the cover picture shows that, instead of a right hard, there’s a barrel in its place. In the cartoon, Inferno uses it as a fire extinguisher. But you can actually swap out the arm cannon with a regular hand. Now, with most Masterpiece Transformers figures, you would need to unplug the arm attachment and then unfold the hand from within the figure’s forearm. Not with Inferno! With this figure, you actually fold in the barrel in the forearm and doing so will reveal a normal right hard. It’s a really neat gimmick as there’s no way you’ll lose the arm cannon attachment as it is permanently affixed to the figure. I wish more Masterpiece Transformers had this gimmick. You also gotta hand it to Takara as they just love doling out accessories because they just figured out in that one scene from the cartoon or because they want to pay homage to the original toy. Inferno’s got a lot of accessories that are like that. Of course, Inferno has his Extinguisher Rifle that he can hold in his left hand or you can actually stick it in a slot near his posterior as well. He also has storage for the Extinguisher Rifle in vehicle mode but we’ll talk more about that later. I find it funny that he needs another gun when he’s already got a menacing looking arm cannon attached to him. Inferno comes with a couple of accessories so you can recreate a couple of scenes from the episode where some big game hunter wanted to get Optimus Prime’s head to hang on his wall as a trophy (yes, that was a real episode). You can attach two dinky looking radio communicators to his forearms. While they look incredibly nondescript, I do like that you can store both of them inside the forearms just in case you badly need them. There’s also that weird living hose that attacked Inferno in the episode. The hose creature is actually pretty detailed as it even has a hinged “beak”. I do wish there was something the hose creature was connected to, though. It just looks strange that it’s dangling on its own. Inferno also has a couple of accessories so that you can make the figure as bland as he looks in the cartoon. By which I mean, you can swap out some of his chromed parts with plain plastic ones. You can exchange the chromed arm cannon with a plastic cannon or his chrome grill with a plastic looking one. I actually don’t see the point of those two options; isn’t the point of getting a Masterpiece Transformer figure is so that you can get a more detailed version of the G1 toy? Why give us the option to make a highly detailed action figure look like a hunk of cheap plastic? But his best accessory in robot mode is also the strangest. You can attach a grill that has these two protruding clear plastic braces jutting out. What are the purpose of these plastic braces? It’s so that you can have him carry an Autobot in his arms! More specifically, MP-13 Red Alert, because that who Inferno carries in the episode Auto Berserk. I did find out that you can use the braces to carry most of the Masterpiece Autobot cars to varying degrees of success. But it works best with the Lamborghini Masterpiece robots. I don’t have Masterpiece Red Alert but I do have a Masterpiece Sideswipe and he fits incredibly snugly. And, thanks, to Inferno’s incredibly strong ratchet joints in his legs, he can carry him with hardly any fidgeting to get both figures to balance. Like most Masterpiece Transformers, the way you transform Inferno from robot mode to vehicle mode and vice versa, is a lot of fun. Takara pulled off another engineering marvel with MP-33 as a lot of the pieces move and fit into each other incredibly snugly for the most part. I will say that, the first time I tried getting him into his vehicle mode, I had some trouble jamming his head into the front cab. It turns out there’s a trick to it; you need to fold the wings on the sides of his head really deep inside so that it can pass the gray piece. Once I figured it out, the transformation was a snap to memorize. Unfortunately, Inferno’s vehicle mode is kind of a downer as this mode has a lot of glaring flaws. 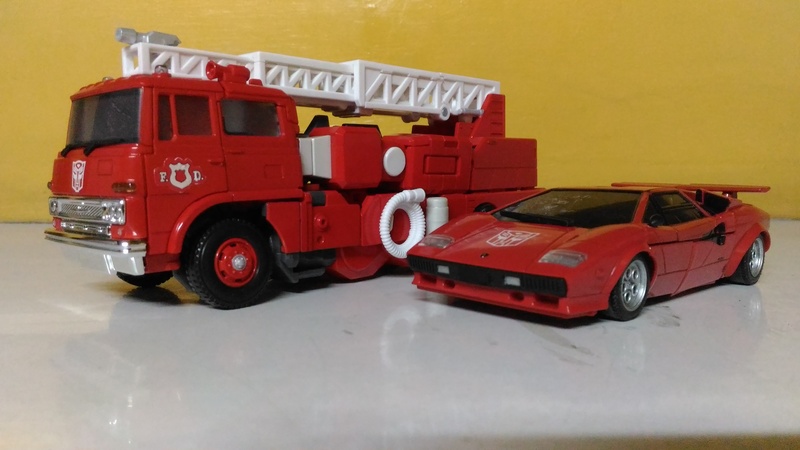 The biggest one is how Inferno’s fire truck mode doesn’t scale all that well with the other Masterpiece Transformers. In robot mode, he scales perfectly with the other figures but you do expect a Mitsubishi Fuso F-Series FT to be much bigger. It should dwarf Sideswipe in vehicle mode but it clearly doesn’t. Besides that, there are also a few niggling flaws with Inferno’s vehicle mode. The fenders around the front wheels has a large gap, which looks really cheap. The rear portion of Inferno’s vehicle mode also lacks a whole lot of detail. Basically, when he’s in his Mitsubishi Fuso vehicle form. Inferno just looks boring. 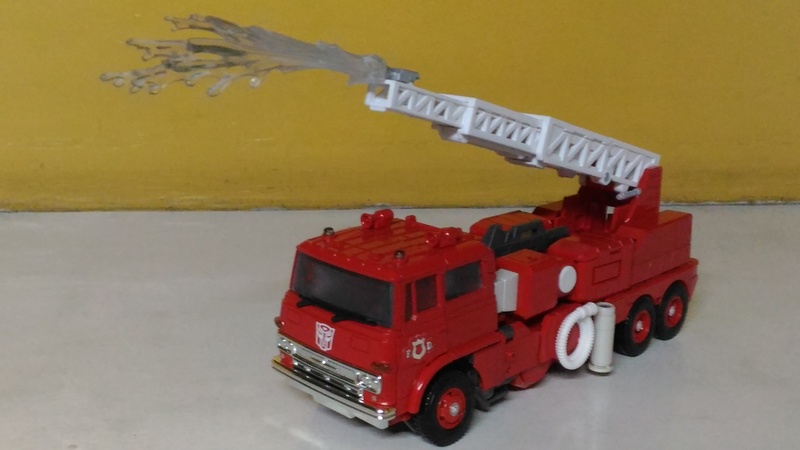 There are a few good points when he’s in fire truck mode. For one, you can store his Extinguishing Rifle in the crevice under the ladder portion. I also like how Takara made it so you can fold up the ladder portion to facilitate the figure’s transformation yet still extend it to some length. I also like the little plastic water spray accessory you can attach to the tip of the hose that’s located at the end of the ladder. You can attach this same accessory to his arm cannon in robot mode. But I just think it looks better when he’s in his vehicle form. Despite his rather derpy looking vehicle mode, I can still highly recommend MP-33 Inferno to collectors. His robot mode is fantastic and the ratchet joints will ensure you can get him to do some really dynamic poses easily. Get him for his robot mode only and forget he even transforms into that disappointing vehicle mode. 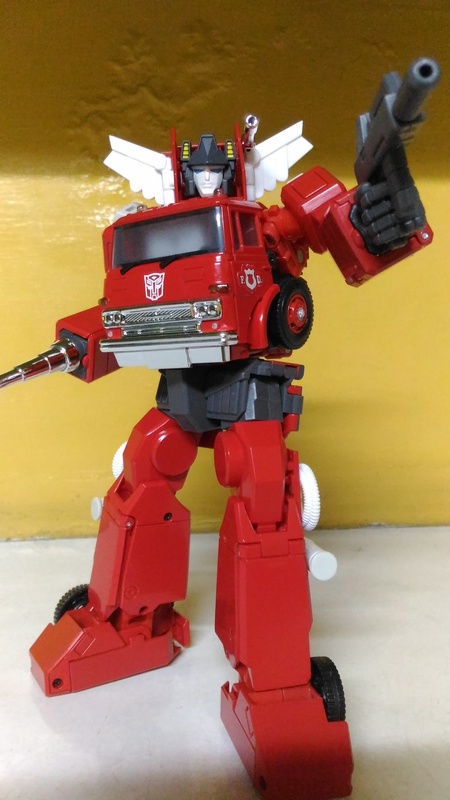 What do you think of MP-33 Masterpiece Inferno? Let me know in the comments section below! ← Episode 199: Should Wrestlemania Be Split in Two Shows?